Tri-Mer industrial exhaust hoods are ideally suited for corrosive or volatile exhausts: mists, vapors, gases, aerosols and fine particulate. Construction materials include polypropylene, PVC, galvanized or stainless steel and alloy materials. Fire suppression and explosion-proof construction are offered. Standard features include a low maintenance design, 110V power operation and minihelic exhaust gauge. All exhaust hoods can be equipped with activated carbon or HEPA filtration. Tri-Mer industrial exhaust hoods are supplied alone, or with duct assemblies and/or integral fans. Each hood is custom-fit for the tank or workstation. 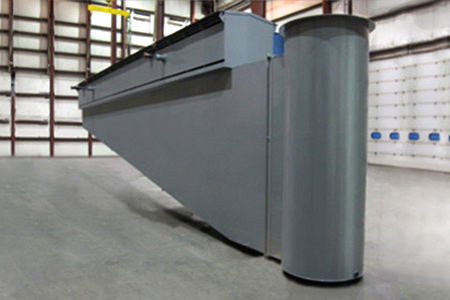 Tunnel fume hoods are manufactured for long tanks, such as those used in etching and metal finishing operations.